Embellish the Lace to Decorate Resume in Cotillion: Non-pace handicappers became repulsed by Embellish the Lace’s ninth-place finish in the Mother Goose (GI) at Belmont Park a few months ago. After all, she lost by 11 lengths. On closer inspection, the two fillies dueling with her missed the board as well. The race collapsed, meaning the flow favored closers to an extreme amount. Embellish the Lace then won the Alabama (GI) at Saratoga, and attempts another win in the Cotillion Stakes (GI) this Saturday at Parx. She currently owns three wins out of five starts. The pedigree is superb as a half sister to Afleet Express and Reporting for Duty. No wonder she cost $320k as a yearling! Anthony Dutrow trains the recent graded stakes winner. Her win in the Alabama went perfectly. She went to the front and no one contested, as she kept a one length advantage through the early portions. Uncontested leads in dirt racing almost always translate into victory. Once the horse gains confidence and opens up on the turn for home, the closers are too far back to make a significant rally. I’m a Chatterbox closed towards the end, but only to a little less than two lengths. Some handicappers might downgrade Embellish the Lace for receiving a perfect front-running trip. They should consider two factors to counteract the logic. Rider Javier Castellano rarely gives a poor ride, which means another good trip is in store. Embellish the Lace also draws the third post position. For the last two years, the inside paths played kindly on this card. The myth of a Parx dead rail does not exist for this race because of the wider audience watching. With the higher amount of observers betting on Parx, they want to make sure no one complains. At least, that is one theory for why inside speed holds up well on the Pennsylvania Derby card. Maybe the trend changes this year. Embellish the Lace must avoid a speed duel with the one-dimensional Take Charge Brandi. Trained by D. Wayne Lukas, Take Charge Brandi goes to the lead and stays for as long as possible. No variation exists in her strategy because the connections believe she runs better when left alone to run how she likes. Despite the concern, Take Charge Brandi’s effort in the Test (GI) is entirely forgivable. While her two-year-old campaign involved a couple of successful sprint races, her pedigree shows a number of route influences including the dam Charming, whose siblings are Will Take Charge and Take Charge Indy. Route horses with speed are not always quick enough to keep up in a quick-tempoed sprint event. Furthermore, she came off a layoff. One of the other usual suspects, I’m a Chatterbox, makes an appearance in this spot. While lacking an official Grade I win, she hit the wire first in the Coaching Club American Oaks (GI) before a disqualification changed the order and made Curalina the winner. 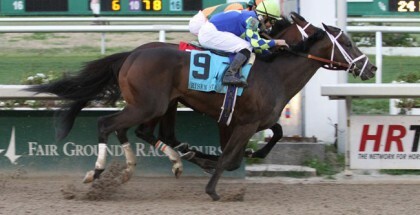 She turned the tables in the Alabama by running over three lengths ahead. Unfortunately, Embellish the Lace outran both of them. For a longshot, try Peace and War for the underneath slots in exotics. Late runners such as this one tend to clunk up for a piece of the pie. Peace and War finished second in the Delaware Oaks (GIII) last time and an ungraded stakes two starts ago. The Alcibiades (GI) winner last fall requires a fast pace for her best effort, and if Take Charge Brandi hooks up with another speedy contender, a pace collapse may come. One of the favorites should take the Cotillion. 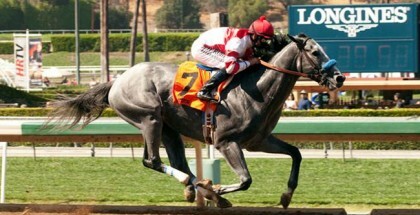 According to a quick Google search, the verb embellish means to “make (something) more attractive by the addition of decorative details” or to “make (a statement or story) more interesting … by extra details.” If Embellish the Lace wins here, she will certainly decorate the resume with another important graded stakes win.